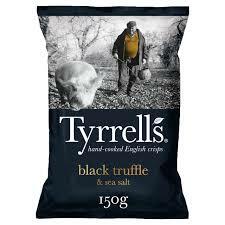 These were very smart and crunchy with a consistent break down of reasonably hardened Crisps. There was no brittleness, neither was there mush. They remained hard throughout but broke down in audible mulches. There were the usual bends and curls of Hand Cooked Crisps, there was also a rough and completely consistently uneven, bumpy and oil blistered surface. There was seasoning visible and some potato skin on edges. A Nose Plunge Test revealed a rather pungent Truffle aroma. This was a very good start. It would be disrespectful of the flavour to claim they tasted mushroomy, but if that’s the most part, yet general fungal flavour description we will go with it. They provided a familiar Crisp paradox – they did not taste very nice, the flavour really doesn’t add anything to a burgeoning range of options, but they were faithful to their flavour description. So, as always, we will grade on the latter rather than the former because taste is in the mouth of the eater.